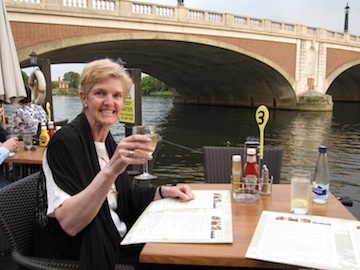 One year ago today, my dear chum Jan and I were celebrating her birthday on the banks of the Thames, at the end of a wonderful week in Walton-on-Thames and environs. But the birthday dinner was truly the crown of a shining week. We couldn’t have been closer to the water without being in the water. The steaks were exquisitely done. The weather was beautiful, as it had been all the time we were in England. 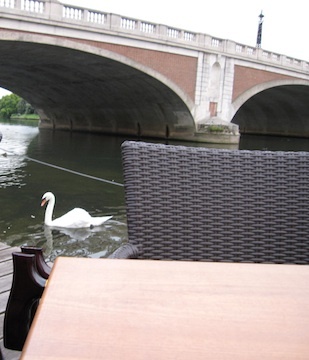 The swan who swam nearby, hinting that gracious people would share their dinner, was not rude nor demanding, although he was not subtle either, swimming up to the edge of the platform and resting his chin there, looking mournful. Eventually, he did share in our cheese tray. We kept the steaks to ourselves. I rather suspect that you would have kept this dinner to yourself and not fed the birds, as well. The evening was a joy. 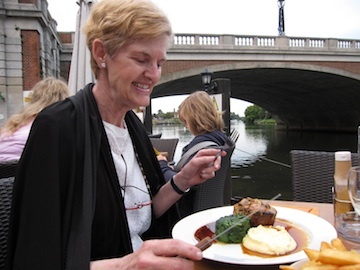 Some day, we shall celebrate The Birthday on the banks of the Thames once again. In the meantime, here’s to you, dear chum! Happy birthday, and many of them. What an amazing way to spend a birthday. What great memories! What a lovely Happy Birthday tribute to your friend. Thanks, Angela. Those steaks were sooooooo good! Is it REALLY a year since we saw each other?? Hard to believe, isn’t it, that a full year has gone by!